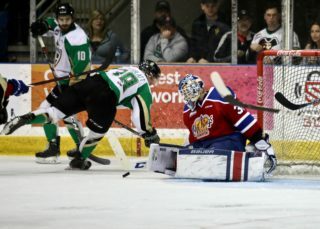 Swift Current, SK – Parker Kelly scored a pair of goals to lift the Prince Albert Raiders (46-7-0-2) to a 3-1 win over the Swift Current Broncos (10-39-2-2) at the Innovation Credit Union i-Plex on Wednesday night. The multi-goal game was Kelly’s sixth of the season and 13th of his career. Dante Hannoun had a goal and two assists, while Spencer Moe chipped in two assists. 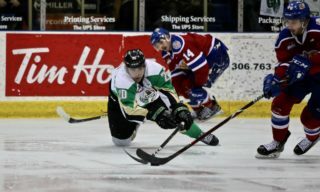 The Raiders dominated possession in the first period and had the best chances of the period. Hannoun was sent in on a partial breakaway but hit the post with his shot. Later in the frame, Cole Fonstad danced through the offensive zone. He tried making the backdoor pass to Ozzy Wiesblatt, but Isaac Poulter broke up the attempt. Hannoun got the Raiders on the board early in the second period with a power-play marker. Moe entered the zone with speed on the right wing and hit Hannoun with a pass. 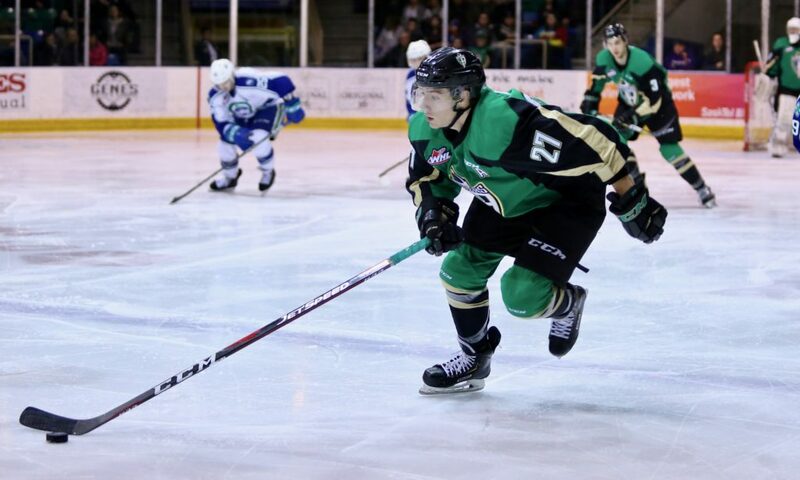 The overager from Delta, BC made no mistake for his 26th goal of the season at the 2:24 mark. SCORES! @hannoun19 finishes a great pass from @spencerm04! Three minutes later, the Raiders struck again. Hannoun made a perfect tape-to-tape saucer pass the width of the ice to find Kelly. The Ottawa Senators prospect used his speed to turn the corner on the Broncos defence and went forehand-backhand to score his 26th goal of the year. SCORES! @Parks_17 pots one on the backhand! The two-goal lead lasted until the 2:49 mark of the third period. While on the power play, Joona Kiviniemi blasted a one-timer past Boston Bilous to make it a 2-1 game. From there, the Raiders once again controlled the play. The pressure eventually led to the insurance goal with 4:37 to play. Hannoun took a drop pass from Moe and put a shot on net that was stopped by Poulter. Hannoun collected his own rebound and threw a pass out front that Kelly one-timed past the Broncos goaltender for his 27th of the year. SCORES! @Parks_17 pots his second of the night on a feed from @hannoun19! 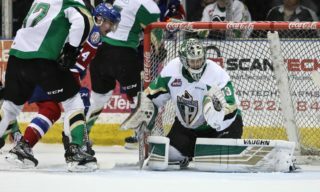 Bilous made 15 saves on the night to earn his fourth win as a Raider. Poulter turned aside 40 Raider attempts in a losing effort. 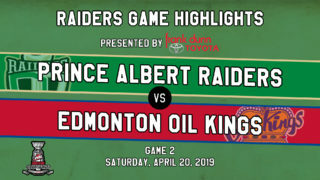 The Raiders are back in action against the Brandon Wheat Kings on Friday night when the Raiders will once again be wearing their 1988-89 throwback sweaters. 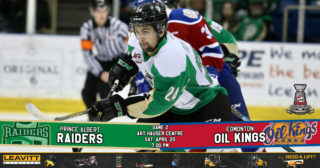 Puck drop 7 p.m. Tickets are available at raiderhockey.com and the Raider Office.